Though granite countertops have been the high end mainstay for years, Silestone is becoming increasingly popular for countertops. Silestone is basically made out of a composite of quartz material. Silestone countertops are typically about 10-20% more expensive than Granite countertops, however it provides a slightly more elegant look. It also comes in about 48 different colors. What makes it rather unique is that the quartz material sparkles providing a glimmering radiance that is unmatched by granite. Silestone can be used in kitchens, bathrooms, or bars. It can be used on floors and walls and it is widely available. Silestone is available through approximately 3,500 retailers including all EXPO Design Center® stores, Home Depot® locations, e-counters.com. Though Quartz is a very hard material, cutting on the surface can cause marks. In addition, it is also heat resistance but it is not recommended to place hot pots or pans on. The adhesive material that binds the quartz together could turn color with too much heat. Silestone is non-porous so it is impervious to stains. It is also an extremely hard material and will have less likelihood of chipping, compared to granite. 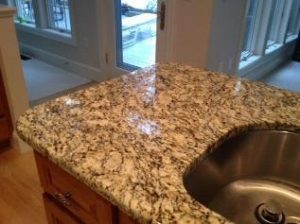 In addition, unlike granite, periodic sealing is not required. Granite has advantages over Silestone as well. Unlike Silestone, or other engineered quartz stone countertops, it is a natural product. It is simply quarried, cut and polished prior to arriving at your home. Granite countertops also come in many different colors and patterns. As with Silestone countertops, Granite countertop can be cut to have square or beveled edges. It is also slightly less expensive and is also relatively low maintenance. 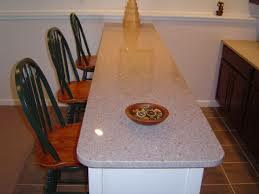 Yes, granite countertops occasionally should have a sealer applied, however it is very simple to do. The decision on granite vs. silestone is a tough one for the homeowner. Each have their advantages. The best advice, visit a local countertop distributor and look at the two products side by side.